Grunge Up was surprisingly establishmentarian. A deceptively mellow ale made from dark malts, hallertau and spalt hops, and munich and caramunich grains, Grunge Up resembles the body and feel of both oktoberfest and amber beers without tasting quite like either. Grunge Up is dark and leathery, a little bit creamy and a little bit smooth, with a little kick at the end. Break out the flannel and get Grunged Up. 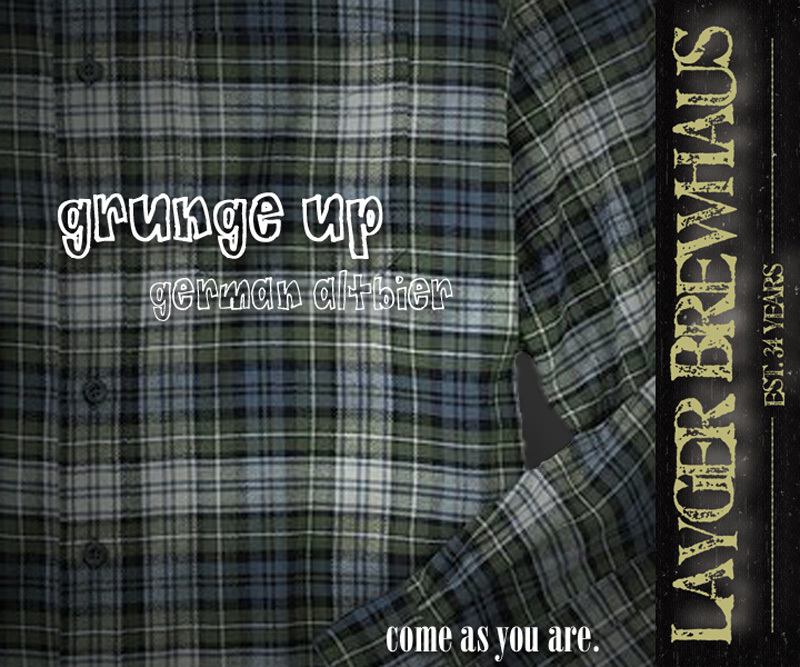 “For the grunge beer, I wish I had a sarcastic yet witty comment. Sadly that would betray this beer’s simplicity. As with the others, the carbonation is light and the flavor mellow. For being an “Altbier” it tastes young and fresh. I’m not sure this is the goal. The hops are apparent in a very pleasant blend. Not too bitter with a mellow sweetness. Another refreshing beer.”—Ben W.
Based on the Crazy Old Man Altbier recipe from Charlie Papazian’s book Microbrewed Adventures. Dark in color, medium hoppiness. Deceptively mellow. Resembles body and mouthfeel of oktoberfest and amber beers. Dark and leathery. A little creamy and smooth. A little kick at the end. 2. Heat 2 gallons water to 150 deg F and add grains. Let steep for 30 min. 4. Add malt extract syrup. Using a nylon bag, also add the 1.5 oz. hallertau hops, and 1.25 oz. spalt hops. Bring to a boil. 5. Boil for 100 minutes and add .75 oz hallertau hops to the nylon bag. 6. Boil for 10 minutes and add Irish moss. 7. Boil for 10 more minutes and remove from heat. 8. Place the brewkettle in an ice bath for 30 minutes. 9. Sparge the hops, discard. 10. Transfer the wort to the fermentor and top off to 5 gallons with cold water from the sink spray hose. 11. When the wort has cooled to 70 deg F, add the yeast, stirring well. 12. Ferment 1-2 weeks at 70 deg F.